Apple (AAPL) faces a monumental continuing growth challenge. It is so large that in order to continue growing at its recent pace, it has to create revenue and market-cap each year equal to the entire revenue or market-cap of major companies. 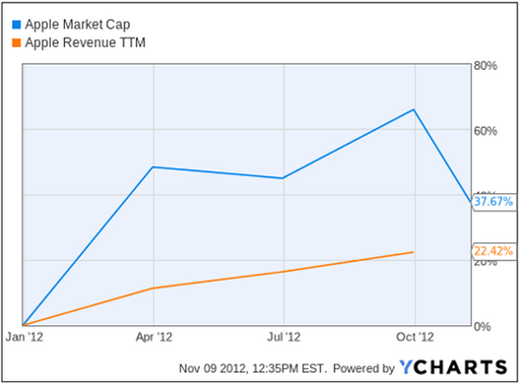 This chart from YCharts.com shows that Apple increased its market-cap by nearly 38% in the last 12 months, and its revenue by about 22%. In light of that growth data, let’s see, denominated in companies, what would be entailed for Apple to increase its market-cap and revenue by 20% to 25% in the next 12 months. At about $515 billion in market-cap and about $157 billion in revenue, they would need to increase market-cap by $103 billion to about $129 billion; and increase revenue by $31 billion to about $39 billion. They may well do it, but when the size of the growth hurdle is denominated in the named other large company equivalents, it is simply amazing. They need to grow incrementally by amounts annually that are equal to or greater than the total lifetime accomplishments of major corporations. It puts a different lens on the growth challenge, and gives rise to reasonable questions about the limits to growth — how much they can continue to add year upon year. This entry was posted on Saturday, November 10th, 2012 at 9:15 AM and is filed under Analysis, Data, Interesting Charts. You can follow any responses to this entry through the RSS 2.0 feed. Both comments and pings are currently closed.